Genuine U.S. Air Force and Navy issue sunglasses are manufactured under military specification MIL-S-25948H. Genuine U.S. Air Force and Navy issue sunglasses are manufactured under military specification MIL-S-25948H. They screen out harmful UV rays giving you 98-100% UV protection. They’ll give you distortion free, glare free, prism free vision in true neutral grey color. They’re tough too. Impact and scratch resistant, they come in 23-carat gold, matte black or gunmetal with 52, 55, or 58-mm lenses. Carrying case and microfiber lens cloth included. Which Size Do I Wear? Not sure if a 52mm, 55mm, or 58mm frame is right for you? Here we will show you how to tell which frame will fit you best. Looking into your mirror hold a ruler so it is lined up with each temple. 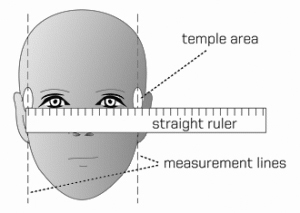 Measure in inches the distance between your left and right temples. Use the chart below to choose a frame size that will best suit your face. You can also use the size from a current frame you own. Look on the inside of each temple to find the size of the frame (see illustration below). The eye size is usually first, then the bridge size, then the temple size.